To be fair, Luna only actually “logs in” to the game machine once,1 and it seems to be more of a gag playing off of Cold War spy tropes than anything else. 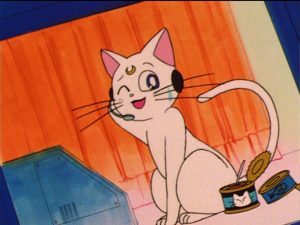 Though we finally learn that it was Artemis all along who was feeding Luna information,2 it’s actually never really explained in the Japanese anime who Luna thought she was communicating with. The manga differs quite a bit in this regard, but for now we’re going to just focus on the anime. Now, for anyone who has watched enough about Sailor Moon, I’m sure the moon and the rabbit connection. What you may not know, though, is what all this talk concerning mochi is about. 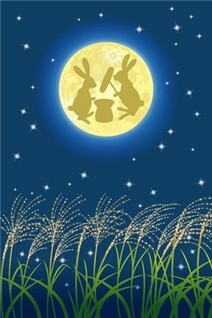 Well, the story has it that according to ancient Chinese folklore, the rabbit on the moon had a mortar and pestle and was pounding/mixing an elixir of life.4 When this legend made its way to Japan, the contents of the mortar changed to rice (to be made into mochi) and the pestle to a mallet. One explanation5 for why this happened is that one (of many!) Japanese words for a full moon is 望月 (mochizuki; a full moon)6 This happens to sound awfully like the phrase for making mochi, 餅つき (mochitsuki; pounding mochi),7 which is likely how the change took place. As for the puffing up?8 A traditional way of eating mochi, especially in the Fall and Winter, is to put it over a small coal-fired grill to heat it up. As it heats, the mochi puffs up like a balloon. So anyway, now that we’ve explained everything other that what I intended to talk about today, let’s take a look at Luna’s code name, 0091. Depending on your take on things, one of the most interesting/frustrating things about Japanese is that it seems that everything can be read in multiple ways. Throughout this blog, I’ve discussed names many, many, many, many times as well as the way that kanji can be played around with to give further subtext to a name. What I don’t often have a chance to talk about is that numbers also can be ready differently, for further meaning. Never before was this more useful or noticeable than when pager culture was booming in Japan in the early- to mid-90s, but it also crops up a lot in phone numbers and elsewhere. By using common (and some uncommon) readings for numbers, you can actually make up words. The problem is that when making words, numbers can be read in a variety of ways, making the reading confusing. The number 8, for example, could be read as: hachi, yatsu, yo, ha, ya, ei. As such, that means that this is really just an interpretation on my part and no one on the anime has ever commented on Luna’s code name before. However, my assumption is that — in light of how the rest of the scene goes — this is also an in-joke and a reference to Usagi. Read also: Why Are the Black Moon Clan's Names Spelled Incorrectly? One possible reading for the numbers 0091 o-o-gu-i, which when written into Japanese becomes 大食い (oogui; big eater).9 While the word is now generally used for competitive eaters, the word used to appear10 more often in the form of 痩せの大食い (yase no oogui; a thin person who eats a lot)11 — pretty similar to Usagi, no? So there you have it! 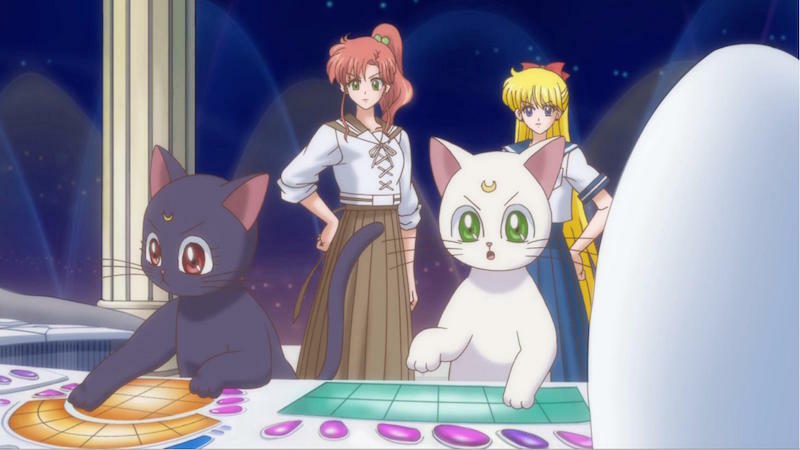 Not only does Luna — prior to knowing the identity of the Moon Princess — make several references to rabbits and the moon, but her code name itself may even be a reference to Usagi! Of course, I want to make clear that this is pure speculation on my part, but seeing as how many small references are put into Sailor Moon, I have a hard time thinking that they just picked some random numbers. Maybe one of these days someone involved in the show will write a tell-all book. We can dream, right? ← Why Was There No Sailor Stars Movie? the real explanation is that 91 means the year when Sailor Moon anime appeared . Who doesn’t know that .? Uh… Sailor Moon the anime debuted in March 1992, NOT 1991. So in fact, LOTS of people “don’t know” that so-called fact. 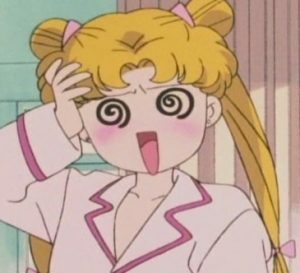 As for the Sailor Moon manga? It first appeared in late December 1991, I think. I considered that this was a possible explanation, but the double zero doesn’t make sense in that case. 1291 maybe would may sense, 9112 maybe. Or for Sailor V, which did appear in 1991, some sort of July/August date might make sense. Eh couldn’t the double zero have simply been because of the popularity of double-O numbers for secret agents in popular culture thanks to James Bond? It absolutely could be! As I mentioned in the article, it’s simply a personal theory. But again, I’m not a fan of the 1991 angle, because the Sailor Moon anime came out in 1992. Though the manga technically came out in 1991, this is simply a matter of printing convenience. On the cover of the magazine and in all official accounts (even in the 10th anniversary movie), the series officially debuted in 1992 for both the anime and the manga. Their writer saw 0091 as a reference to the manga series Cyborg 009-1, which starred a female secret-agent cyborg. It ran from 1967-1970 and 1974. It sounds like a likely reference to me. Huh, I like that theory… thanks for bringing it to my attention!